This is a great way for CCG members or non members to explore together, create fun memories together, and so much more! Fun exploration time for ages 8 months up to 5 years! All children should have an adult joining them on the floor for the entire time during this event. Please dress comfortably, no shoes allowed on the gym floor, and please no coffee/tea, food, or gum on the gym floor. And we ask for each adult to be hands on with their children along with our staff, to have the most memorable time with your children exploring all the wonderful activities, singing songs, and more. 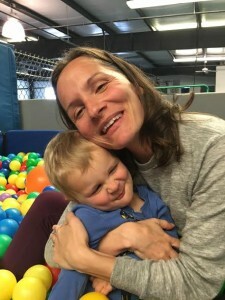 Just a reminder: We’d like to remind adults they should not jump in the foam pit, climb on equipment, or bounce on trampolines, this is an exploration time for all the young children who need adult guidance. We do offer Adult Classes on Tues/Thurs. nights from 8-9:30 pm. Bring-A-Friend to Jungle Gym Exploration Day! 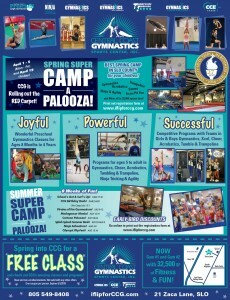 CCG has preschool sized gymnastics equipment! 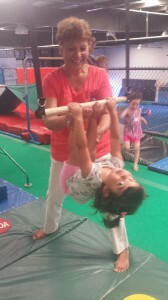 Our Parent Participation classes are not just for parents, we have lots of Grandma’s & Grandpa’s too! Super Roos (2 year olds) traversing the Jungle Gym Circuits! They are just amazing! Crawlers, New Walkers or even young friends learning to run will enjoy this active parent participation class. 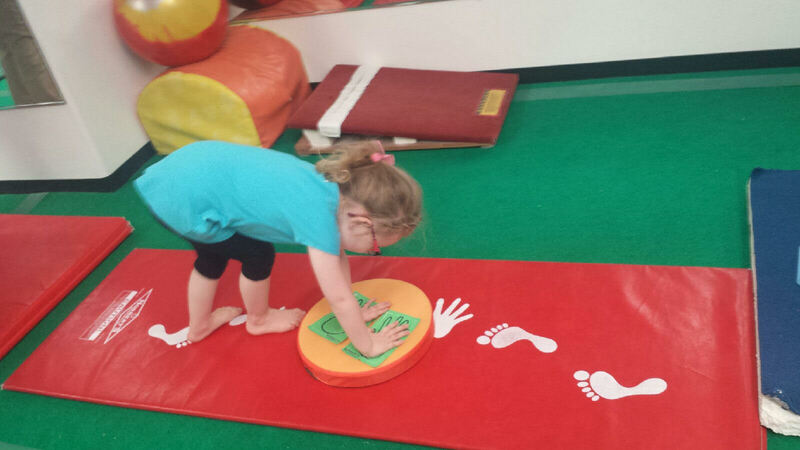 Each week will have a specific focus to introduce your little one to the exciting world of gymnastics with concentration on the small and large motor skills. 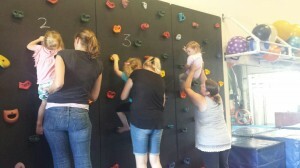 Our 45 min Baby Roos class is a great way to get out extra energy, bond with your little one, meet other parents and babies the same age, and learn gymnastic skills from one of our experienced and knowledgeable coaches!! Running, jumping, crawling and rolling in our parent participation Kangaroo class is a great way to focus all the energy of your little one. 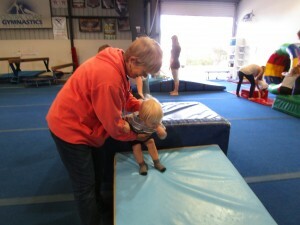 This class is a 10 week session packed full of gymnastics fun. 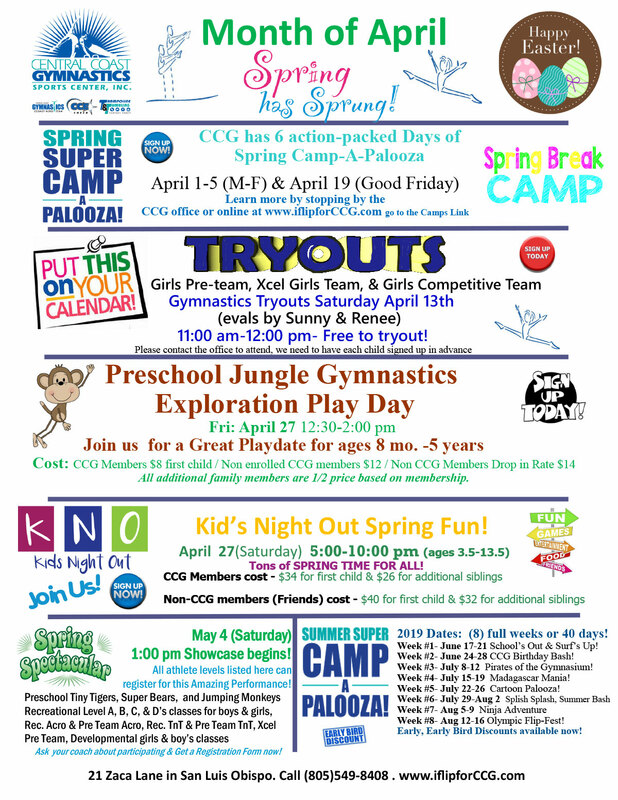 Each week we will focus on a different skill that will teach the basic fundamentals of gymnastics. 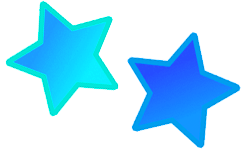 Games, music, movement and age appropriate circuits will be used in a fun and safe environment to get your child use to listening and following an instructor and playing nice with other friends in the class. Keeping your little Kangaroo busy during this 45 min class is an easy task for our caring and knowledgeable coaching staff! 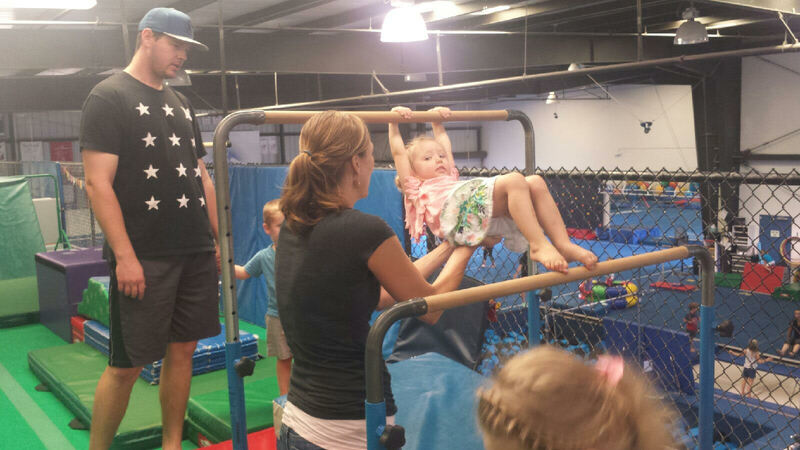 Hanging, balancing, rolling, tumbling and bouncing are just a few of the many activities that your child will participate in during our 45 min parent participation Super Roo Class! 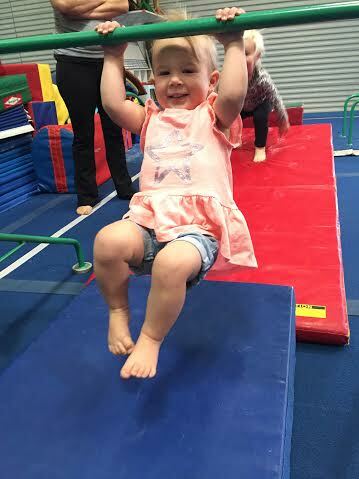 Our Super Roo class is 10 weeks with a specific focus each week to help develop the motor skills necessary for your little one to become a tiny talented gymnast. 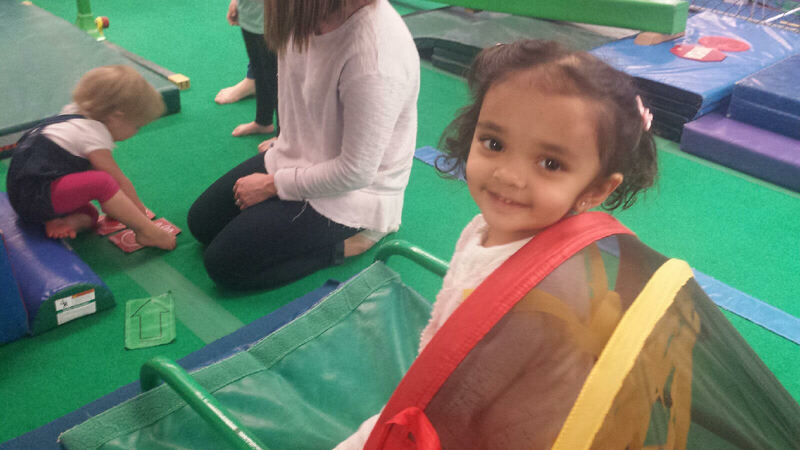 This class will incorporate listening skills, waiting turns and sharing to prepare them for gymnastic classes on their own. Our high energy coaches will utilize the entire gym to build fun circuits, play games, make music and get your little ones energy out in a fun and safe environment. Our Tiny Tiger class is a very special class in our preschool gymnastic program! It is the first time our little friends will explore the wild world of gymnastics on their own. Our fun, loving, knowledgeable coaches will introduce your child to all the components that make up the exciting sport of gymnastics. With amazing monthly themes and incredible weekly lesson plans- your tiny tiger will learn many new skills through the use of our colorful, fun and safe preschool circuits, games, pit, trampoline and much much more! The “jungle gym” where our preschool classes take place, will provide non-stop, high energy gymnastic fun in a 60 min weekly session! 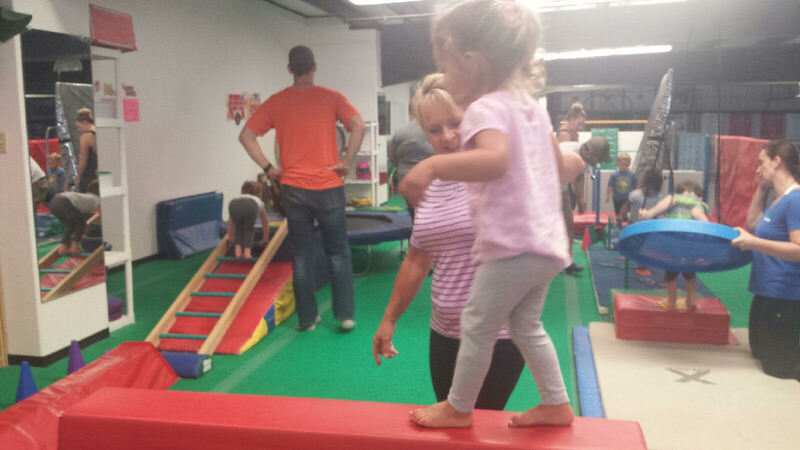 At the top of the list for our preschool gymnastic classes, is our Super Bears class! 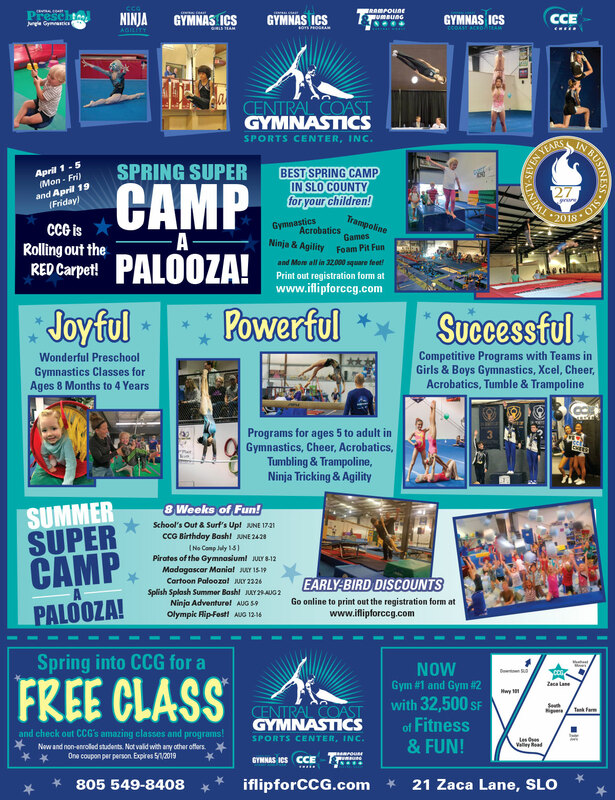 This class will provide your child with an understanding of the components that make up the fantastic sport of gymnastic. Within our weekly lesson plans and monthly themes your child will learn the skills necessary to lay the foundation of strength, flexibility and coordination. Our exciting and caring coaches will lead your child through the circuits, games and activities necessary to build and develop their excitement and love for gymnastic. 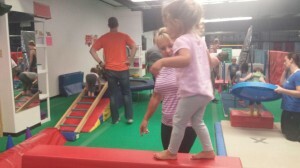 This 60 min class is sure to get your Super Bear to run, jump, roll and flip over gymnastic! No little monkeys falling off the bed in this class. Our 60 minute high speed, bouncing heaven, preschool trampoline and tumbling class is perfect for those children ages 3-5 years of age, even add it on as a second class every week! This class is designed to teach the basics of tumbling and trampoline, along with balance, coordination, and develop strength. 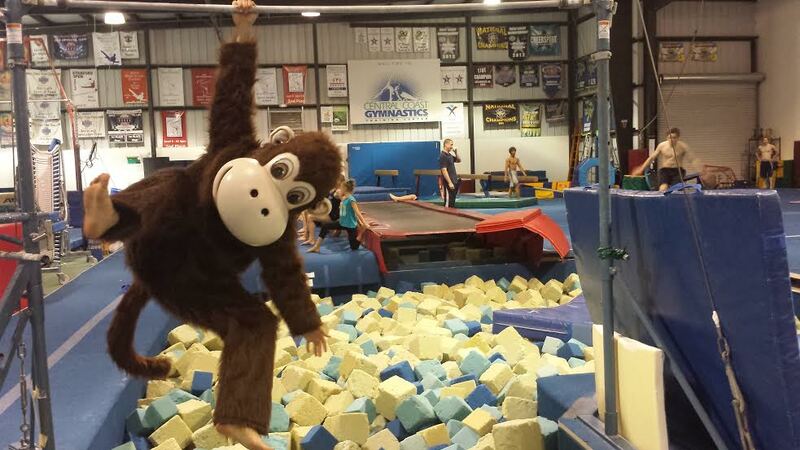 If you are looking for a class that really gets your little monkey moving, then this class is a must for your child. Email our CCG Preschool Program Director, Mimi@iflipforCCG.com or please give our fabulous office staff a call Monday- Thursday 10 am- 6 pm, Fridays 9 am- 6 pm, and Saturdays 9 am – 12:30 pm. 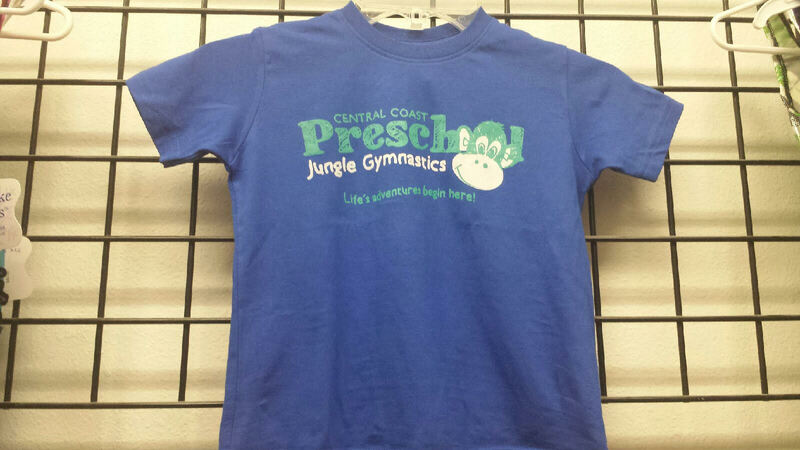 Since 1991, CCG and our amazing preschool gymnastics coaches and owner have been developing, learning, growing, designing, creating, and inspiring movement, development, and more in young toddlers. 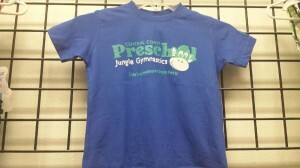 We have created an amazing Preschool Jungle Gymnastics Program. From the newborn to active toddler: It takes just 12 short months for your baby to undergo this incredible transformation. Babies grow and change at an astounding pace, and every month brings new and exciting developments. At CCG, we begin classes at 8 months so we can be a part of that early brain development. Our classes are designed to inspire movement, friendships, and fun as babies may say their first word at eight months, while others don’t talk until a little after the one-year mark. And walking may start anytime between nine and 18 months. We are a part of these developmental stages, and statics show gymnastics helps with each of these stages of development: Our Parent Participation Classes are designed to encourage your baby to start to crawl. This can include scooting (propelling around on his bottom) or “army crawling” (dragging himself on his tummy by arms and legs), as well as standard crawling on hands and knees. Some babies never crawl, moving directly to from scooting to walking. Being around other babies allows for visual learning, as they see others moving, crawling, pulling themselves up, and walking. Babies begin to respond to familiar words like their names, sounds, music, and singing which at CCG integrate all of this into our Parent Participation classes . He may also respond to “No” by briefly stopping and looking at you, and may start babbling “Mama” and “Dada.” It’s Play, Learn, and Grow time with Clap and play games such as patty-cake and peekaboo as they grow a bit older. At CCG we encourage fine motor skill development with our set ups, specialized equipment, sounds, and more. The last development stage in baby’s first year is quite a transition and CCG can play a wonderful role in this developmental time that you cannot get back. Your baby is growing at a rapid pace, she might look and act more like a toddler. But she’s still a baby in many ways. She’s learning to begin feeding herself. Babies at this developmental stage master the “pincer grasp“ — meaning they can hold small objects such as O-shaped cereal between their thumb and forefinger. Holding on to a ball, stuffy, gymnastics bar, rattler, ladder, slide, and many other specialized pieces we have to encourage this development. As they begin to cruise, or move around the room on her feet while holding onto the furniture, we have set ups to encourage standing, moving, and holding as they begin to find the balance point to walk. You can actually see this brain and body development happen while in class each week. They begin to say one or two words, and “Mama” and “Dada” become specific name for parents. The average is about three spoken words by the first birthday, but the range on this is enormous. Point at objects she wants in order to get your attention. They begin “pretend play” by copying you or using objects correctly, such as pretending to talk on the phone. and then it’s one of the biggest moments in life (priceless), when a child beings to take her first steps. This usually happens right around one year, but it can vary greatly. 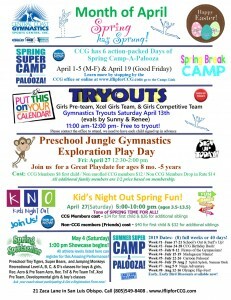 CCG Parent Participation Classes are specifically designed to encourage development in all these areas. Just try it and see! The smiles say it all! 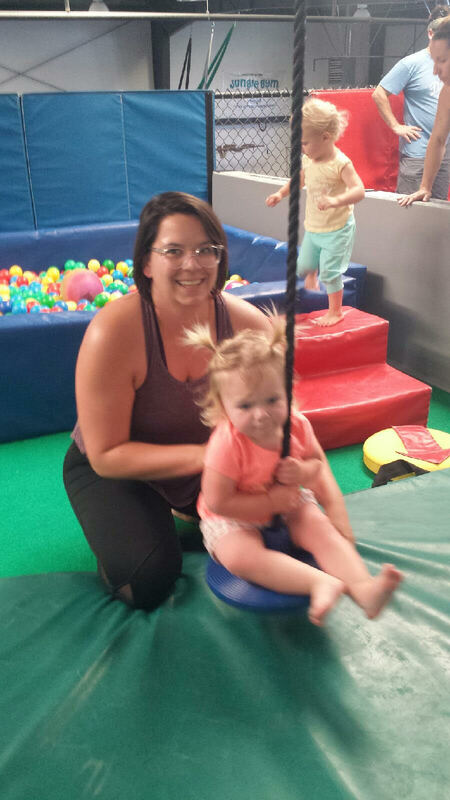 We have been blessed to see countless babies take their first steps at CCG, we encourage you to come in to CCG and try a Jungle Gym Preschool Gymnastics Class or attend the Jungle Gym Exploration Days we offer every month. Check out this page for more details or just call us, we’d be happy to help you. Stop by and see it for yourself! We can’t wait to meet you! to wear to class at CCG! On sale for a great price in the CCG Gym Bag Shop! We came in this morning for a trial class to see if my little guy would like to sign up. He LOVED it! The instructor (I think her name was Krista) was fabulous and very interactive with the children. You can tell she loves what she does. $40 annual fee + the cost of the class ($120) was a little expensive but I think my little guy will enjoy it. Class costs are prorated in case you come in the middle of a class. This is nice so that you don’t have to wait for another full class to start. Most are 10 weeks long and 45 minutes. 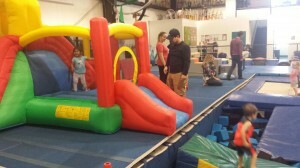 The kids have a blast and it’s a perfect way to get energy out, be active and socialize!